Protip: Anti-evil wards can also be used as defensive shields in a pinch! "No, I cannot do that," she [the Witch of the North] replied, "but I will give you my kiss, and no one will dare injure a person who has been kissed by the Witch of the North." She came close to Dorothy and kissed her gently on the forehead. Where her lips touched the girl they left a round shining mark, as Dorothy found out soon after. To say heroes face trials, enemies, and dangers that imperil their lives with alarming frequency is putting it mildly. Some heroes are hunted even before birth by proactive villains, and regardless of the tendency of such efforts to backfire it behooves the forces of good to take steps to protect the hero. One of the more popular ones (along with hiding them at birth in a common family) is to use a Protective Charm on them. This can be a spell or Artifact of Power that acts as a form of Supernatural Aid that keeps the character safe. It might render them hard to find, naturally harm or repel attackers, or cause Glamour Failure on whoever is using supernatural disguises. Of course, an un-harmable protagonist is too close to being an Invincible Hero, so the charm likely has limitations either in the wording, the method, range, or another part of the protection. One popular limit is it stops working on a Dangerous 16th Birthday. Likewise, it may not protect allies or actively defeat villains, either. Worst of all, though, is when their enemy twists the charm against them or even No Sells it. Of course, wily villains may just trick the hero into giving it to them or someone else. Often White Magic. Compare Kryptonite-Proof Suit. If worn, may be a Magical Accessory. In Omamori Himari, Ordinary High-School Student Yuuto turns out to belong to one of the twelve families of demon slayers. His grandparents gave him a charm that kept the demons at bay until his 16th birthday as shown in the first episode. It then begins to weaken, and when the demons begin to sense his presence, they begin attacking him. Fortunately he has a Action Girl, Himari, whose sole purpose is to protect and serve him, and she comes into his life to protect and help train him to fight demons. Bleach: Isshin gives Ichigo a charm he claims his dead mother once gave Isshin. Isshin doesn't actually mean for Ichigo to be protected by it, however. Isshin knows that Ichigo is a shinigami and that when Ichigo's soul leaves his body to fight as a shinigami, a special spirit called Kon inhabits Ichigo's body so that the humans don't realize Ichigo is "missing" from his body. By giving Ichigo the charm, Isshin ensures Ichigo's body is protected while Kon is inhabiting it. When the arrancar first attack the living world, Kon's life is saved by the power of this charm (and along with it, Ichigo's body as well). 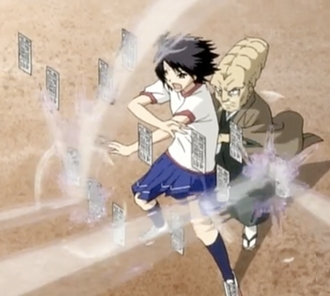 The main character's ability Imagine Breaker, in A Certain Magical Index. His right arm removes any supernatural fete it touches. In issue #12 Ms. Marvel (2014) as a compensation for the trouble he caused, Loki wards the school of the eponymous heroine. She asked for it jokingly and Rhetorical Request Blunder ensued. It's telling that she asked for something to protect others not herself. How well this will work has yet to be seen; he says it's strong enough to stop any attacker up to an ice giant, but... Loki. In Robin Tim's first roommate at Brentwood wears a charm around his neck that he received from his father which he rightly considers his best bet against the demon Arrakhat who was summoned to assassinate him and has to kill five people (no more, no less) before returning to the pit. In Barbie of Swan Lake, the Fairy Queen gives Odette an amulet to protect her from harm... after she's turned into a swan, unfortunately. As Constantine and Chas are about to leave to rescue Angela, Papa Midnight tries to give them a blessing. Constantine refuses it, while Chas accepts it. There's also the protective medallion Constantine borrows from a friend in the beginning. The friend is soon killed, causing some regret. Constantine then gives it to Angela, the object of hell's designs, but she accidentally leaves it behind at an inopportune moment. The Golden Child. Chandler Jarell buys a necklace which ends up protecting him from a demon wielding the Ajanti Dagger. Kwaidan: Hoichi's master writes a magic inscription all over every inch of his body, which makes him invisible to the spirit of the dead warriror. Unfortunately, the master forgets Hoichi's ears. Ugetsu: A Buddhist priest tells Genjuro that Lady Wakasa is actually a ghost, and then scrawls some Buddhist prayers on Genjuro to keep her away from him. Sure enough, when Lady Wakasa sees the characters drawn on his back, she recoils. In the The Wizard of Oz film, Glinda implies that the Ruby Slippers themselves are these. Glinda does kiss Dorothy, but the kiss is not stated to be protective at all. Glinda: Remember, never let those Ruby Slippers off your feet for a moment, or you'll be at the mercy of the Wicked Witch of the West. Shandril is given a magical amulet that will prevent enemies from learning her location. Unfortunately she destroys it when she uses her spellfire ability. Non-detection amulets are eventually issued to almost everyone hunted by magic-users and having a powerful ally — when everyone and their familiar has a Crystal Ball it's a no-brainer. Rinda the Scribe was given an artifact (specifically created for her) that prevents location even by gods — she hides the Cyrinishad. In Finder's Stone series all living constructs has even more universal built-in anti-divination measures of minor artifact level — they were supposed to be superpowered assasins, after all. In The Wonderful Wizard of Oz, it could be argued that the protection from the Good Witch's kiss is less magically protective in and of itself than a matter of not wanting to tick off a powerful witch. Harry Potter's mother's love acts as a charm protecting him from Voldemort (for the first four books, anyway). A more universal version would be the Protego spell, usable by any wizard that knows it, and can block most offensive spells. Also, the reason Harry must stay with his hated Aunt and Uncle is because Dumbledore apparently used a type of charm to protect Harry from discovery by Voldemort until his seventeenth birthday, as long as Harry lives with them. At one point, Dumbledore bluntly reminds Aunt Petunia of this obligation. This is an extension of the protection he received from his mother's sacrifice. As long as he is living in the home of someone else related to his mother, like her sister Petunia, Voldemort and his followers cannot reach him there. The Patronus Charm summons a spirit beast. While it can be used for other things, its main purpose is to repel Dark Creatures such as Dementors and Lethifolds. Used often in the Got Fangs? novels by Katie Maxwell. The main character lives at a dark (but not evil) Circus, where Protective Charms are sold (most of which really do work). Her best friend, a Moravian draws a protective ward across her forehead to keep her safe at one point. The can-tah skoldpadda from The Dark Tower is a small, turtle figurine that protects the Beam of the Turtle and the Bear. The skoldpadda mesmerizes the people it's shown to, which can make them cooperate with Roland's ka-tet, or it can sometimes cause enemies to briefly stop attacking. In Teresa Frohock's Miserere: An Autumn Tale, Lucian tells Lindsey that the Psalter is this. She is quite annoyed when he explains he gave her it to focus, and it was actually her own power. In J. R. R. Tolkien's Smith of Wootton Major, the star. Late in The Wheel of Time series, a character comes across an artifact called an Artham that makes its holder invisible to the Dark One. In Fancy Apartments Carr hands out protective charms to all the residents. (More technically, due to one reason or another, most of them.) There's also his phoenix tear, which can act as a protective charm. In The Girl from the Miracles District, Robin has a pedant that shields him from various types of negative magic to an extent. In Renegades, Nova discovers the Amulet of Vitality, which protects its wearer from poisons and acids. As she and Adrian later discover, it also shields from De-Power abilities like Max's and Agent N's. The original Mark of Cain in The Bible is often misunderstood as a mark of shame or a curse, but it was in fact a mark of protection. When God declared what Cain's punishment would be for killing his brother, Cain protested that other people would attempt to do him additional harm once they learned what he had done. So God granted him the Mark to ensure that Cain would not suffer additional harm beyond what God had already decreed. Classical Mythology: Achilles was rendered invulnerable when his mother dipped him in the River Styx as an infant. Unfortunately, she held him by his heel. Dungeons & Dragons has had a plethora of protective spells and magic items over the years, such as Bless and Prayer spells and the Brooch of Shielding. Perhaps chief among them is the Ruby Rod of Asmodeus, which can surround the user in an invulnerable force field and an Anti-Magic field, then purge them of all damage and adverse effects. Of course, if you're the kind of person who can claim it from the Lord of Hell, you probably don't need it. In GURPS traditionally styled protective amulets can be made using Path/Book rituals. The standard spell system has spells to create charms more in line with the modern concept. One of the things that made the founding of the Order of Hermes in Ars Magica possible in the first place was the timely invention of the Parma Magica, a ritual taught to every wizard of the Order as a matter of course that provides protection from the magic of others — both outsiders and potentially hostile members of their own organization. Purity seals in Warhammer 40,000 serve to protect Imperial soldiers, vehicles, and even weapons from the corruption of Chaos. They don't always work. There is also mention of other sorts of inscriptions and holy relics used for similar purposes. In Harry Potter and the Forbidden Journey, there's a throwaway line in Dumbledore's office that mentions how the riders have had numerous protective spells placed upon them. This is the in-universe justification for why they're able to No-Sell dragon fire, acromantula poison, and the Whomping Willow's attacks. The only thing the riders aren't safe from are the Dementors, requiring Harry to step in. In "Shounen Kininden Tsumuji" Tsumuji is given a magatama that protects him from being turned to stone. In Red Dead Redemption, if you're a consistently good person, you can get a special item from a nun. The item in question is a cross pendant that actively deflects bullets fired at you. The games often have the status effects Protect and Shell. These reduce physical and magical damage (respectively) by as much as 50%. Protect is almost always a boon, but Shell sometimes also reduces the effect of healing spells, which can make it a Useless Useful Spell. Similarly, the status effect Reflect bounces magic back to its target, meaning enemy mages need to attack physically, or have their own magic bounced back at them. However, this also works with friendly magic, meaning that characters need to be healed through the use of items. Many games in the series also include items known as Accessories or Relics, which typically defend against (or add) one particular status effect. The most notable is probably Ribbon, which usually defends against nearly all negative status effects save Death. Jinxie Tenma from Phoenix Wright: Ace Attorney  Dual Destinies has a lot of them in her arsenal. She believes they will protect her from the dangerous yokais living in Nine-Tails Vale. Her father has tons of them pasted all over his head because he says they restrain his inner demon Tenma Taro (a yokai). Jinxie even stamps a charm on Apollo's forehead because she thinks Apollo's a demon lawyer. This one becomes a Running Gag, as the charm is dropped and replaced periodically, unluckily for Apollo. In Umineko: When They Cry, Maria gives Jessica a Scorpion Charm with a protection spell on it in the very first visual novel. However, it's implied that the "charm" is really just a plastic toy. In Sinfest, the angel's glitter appears to act as this. It nullified Baby Blue's hostility to Crimney when he appeared in Hell, and it warded off the zombie from Monique. Inverloch has Kayn'dar's pendant. His parents intended it to protect him from harm, which didn't stop him from getting kidnapped, but it is still linked with him. Acheron can get flashes of memory through it. It turns out that Kayn'dar managed to put all of his memories in it before Raul swapped his soul into the real Acheron's body. Slightly Damned has fairy kisses so the fairy queen knows not to murder you. (At least not right away anyway.) It also comes in handy for different reasons. The SCP Foundation restores the Mark of Cain to its former meaning with SCP-073 , Cain, whose mark rebounds all harm onto the would-be attacker. The Justice League episode, "Alive!" had Tala lead a mutiny against Lex Luthor. However, when she attempted to attack him directly with her magic, she was defeated when it was turned against her. As Tala is dumbstruck how that was possible, Luthor, a mad, but very open minded, scientist, reaches into his shirt to show his magic amulet noting, "You wouldn't believe how much this cost me..."